A digital drawing from Allison Guy’s Pigeon and Tonic series. This 10″ x 8″ drawing comes unframed in a protective plastic sleeve. Category: Allison Guy, Drawings, Prints. A digital drawing from Allison Guy’s Pigeon and Tonic series. 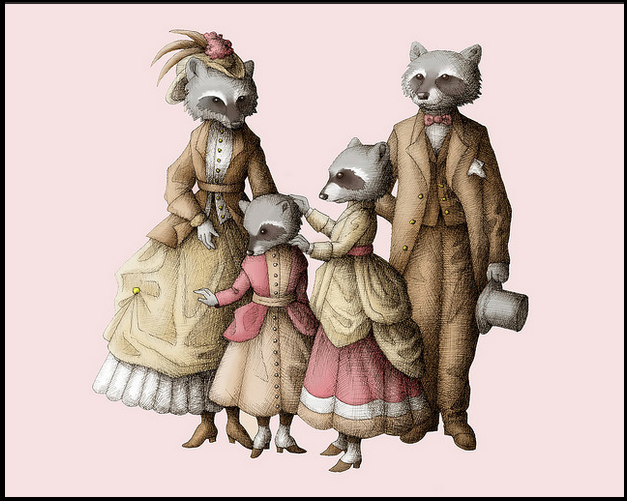 Guy’s distinctive rendering of animals in Victorian garb was first featured with Recession Art in 2009 at No Money No Problems. Allison creates fanciful detailed drawings first by sketching them in pen, then scanning them into her computer, and coloring them in digitally. Her work is part of a lifelong dream to illustrate and publish children’s books. This print comes unframed in a protective plastic sleeve.